Good. [ No Hassle 30 Day Returns ] [ Edition: reprint ] Publisher: Scholastic Pub Date: 1/1/1961 Binding: Hardcover Pages: 32. Written in the 1930's, but will appeal to young ones hearing it for the first time. Great animal adventure story. May require a post-conversation about how some people live in China today. I checked this book out from the library and my grandson read it over and over and over again. So when it was time to return it, i came to Alibris to find him his own copy. 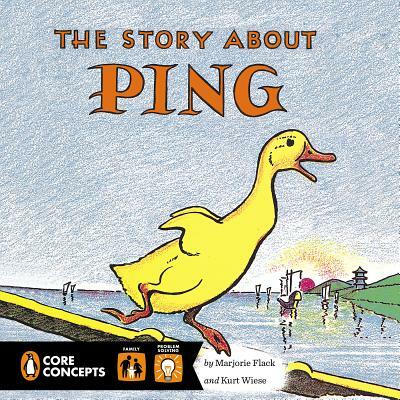 It's a great children's book about a little duck Ping and his adventures on the Yangtze River. Ping gets a little spank on the back for coming home late, but he is thankful to be home and with his family. I like the opening page, "Once upon a time there was a beautiful young duck named Ping. Ping lived with his mother and his father and two sisters and three brothers and eleven aunts and seven uncles and forty-two cousins. Their home was a boat with two wise eyes on the Yangtze river...."
I definitely like most of Ping. Ping learns a valuable lesson. And, usually, in order to fully realize a life lesson, it is almost always preceeded by a harsh event or reality. You will be relieved to know that all ends well for Ping, and an important lesson is learned. So, in regards to this well written book, graced with quaint and appealing illustrations, I mostly like it.